and determine why anyone would want to harm her. As Emily's unknown enemy becomes increasingly violent, Archer may be the only person who can keep her alive. The latest book in Susan Sleeman's First Responder series is amazing!! I absolutely loved Skylar and Logan's story in "Silent Night Standoff" and Cash and Krista's story in "Explosive Alliance." I really didn't believe that Susan could top them, but she certainly did! If you missed the previous books, you can learn more at http://www.susansleeman.com/books/first-responders/ I read lots of suspense books and can usually figure out the villain long before the book is finished. But that is not the case with Susan's books -- I love all of the twists and turns. I also love how each book has a spiritual message without being "preachy." In Silent Sabotage, Emily Graves in trying to help her aunt save her struggling bed-and-breakfast, but Emily is the one who needs saving! Sheriff's Deputy Archer Reed comes to the rescue -- several times -- but will he be able to solve the mystery before it is too late? Will Emily be able to overcome her control issues to allow Archer and his friends to help her instead of trying to do everything by herself? One word of advice -- you will not be able to put this book down!! 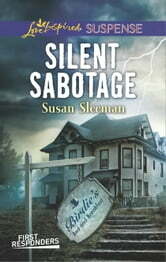 I really enjoyed reading Silent Sabotage (as well as the other books in the “First Responders” series). Susan writes masterful suspense books, but she adds depth to her characters that always draw me in. I especially related to Emily and Archer in this book—both strong, independent people who hide their vulnerabilities with tough personas they’ve developed. They’ve learned not to trust anyone except themselves, and no matter how drastic the situation, they act fearless and jump in to take action. I relate to that—it’s how I’ve lived most of my life. So I needed to be reminded that no one can handle everything in life alone, we all have to learn to accept help, to take the risk and be vulnerable, and most of all—to trust that God can handle problems much better than we can, since He sees what we cannot. It’s hard to put down this book (I read it in one day! ), and it’s completely unpredictable. Excellent read! So glad to finally read Archer's story! So glad to finally read Archer's story! Although Silent Sabotage is part of Susan Sleeman's First Responders series, you don't have to read the previous four books to enjoy this one. I do recommend all the books in this series though because they're all great. I received this book for free from the author in exchange for an honest review which this is. What I liked about this book and the previous First Responders books was that the characters are developed and believable. If I was involved in a hostage situation, I would want someone like Archer handling the negotiations. Like so many people today, Emily is caring for an elderly family member that has Alzheimer's. There was just enough interaction with the other First Responders characters. This was a great well paced mystery with lots of suspects - all with logical reasons why they could be guilty. I really enjoyed this book and the way it ended.